One of my pet peeves is the recent trend to petition the ICZN to designate a more complete specimen the neotype of a taxon when the fragmentary holotype hasn't even been shown to be undiagnostic. A recent example is Paul and Carpenter's (2010) Allosaurus petition when the holotype hasn't even been well described outside a thesis or ever compared to the other accepted allosaurid genus (Saurophaganax). Generally thoughts about which specimens are diagnostic varies, so regardless of how much laziness is involved in these petitions, there's excusable subjectivity too. But while researching Allosaurus' case for the big New Years Theropod Database update, I found a Majungasaurus petition I hadn't heard about, and it's a weird one. The applicable ICZN Article is 75.5- "When an author considers that the taxonomic identity of a nominal species-group taxon cannot be determined from its existing name-bearing type (i.e. its name is a nomen dubium), and stability or universality are threatened thereby, the author may request the Commission to set aside under its plenary power [Art. 81] the existing name-bearing type and designate a neotype." Most of the original syntypes of Megalosaurus crenatissimus- A. Fourth premaxillary tooth FSL 92.306b (left) and posterior dentary tooth FSL 92.306a (right) in lateral view. B. Pedal ungual FSL 92.290 in side view. C. Distal caudal vertebra FSL 92.289 in lateral view. D. sacral centrum FSL 92.343 in lateral view. Scale equals 10 mm for A, and 30 mm for B-D. After Krause et al., 2007. A brief history of Megalosaurus/Majungasaurus crenatissimus is as follows. Deperet (1896) described crenatissimus based on five unassociated elements- two teeth, two partial vertebrae, and a partial pedal ungual. Lavocat (1955) later described a dentary he referred to crenatissimus, based on dental similarity. More complete skulls and skeletons were described in the 90s and 00s. Krause et al. (2007) tried to make the dentary the type specimen, but this can't be done without an ICZN petition, as I said at the time. So they did the right thing in a way, and petitioned the ICZN (Carrano et al., 2009). Neotype of Majungasaurus crenatissimus, dentary MNHN.MAJ 1 in A. lateral, B. dorsal, and C. medial views. Scale equals 30 mm. After Krause et al., 2007. The problem here is that for Article 75.5 to work, the type must be a nomen dubium. Carrano et al. state "As several authors have confirmed (Sampson et al., 1996, 1998; Krause et al., 2007), the original Depret type specimens are indeed indeterminate as to genus and species, although they can be identified as belonging to the family ABELISAURIDAE. Thus the taxonomic identity of the species Megalosaurus crenatissimus as a nominal species-group taxon cannot be determined from the existing name-bearing type materials." Sampson et al. (1996) never says this, and indeed refers a premaxilla to crenatissimus based on similarity to Deperet's syntype teeth. Sampson et al. (1998) did support this position (merely via the statement "none of the specimens appear to be diagnostic to the generic level" that was not supported by any data), which is why they called the new more complete specimens Majungatholus atopus, a name based on a skull roof described in the 70s. Most importantly though, Krause et al. (2007) say the opposite of what Carrano et al. claim they did. Krause et al. state "Furthermore, detailed examination of the teeth preserved in MNHN.MAJ 1 [the dentary] by Smith (this volume) reveals that they fall within the same size and shape parameters as the two isolated teeth (FSL 92.306a-b) described by Depéret (1896a, b), those preserved in the gnathic elements of adult individuals described by Sampson and Witmer (this volume; e.g., FMNH PR 2008, 2100; UA 8709, 8716, and 8717), and the thousands of isolated teeth recovered from the Maevarano Formation by Mahajanga Basin Project personnel and others. 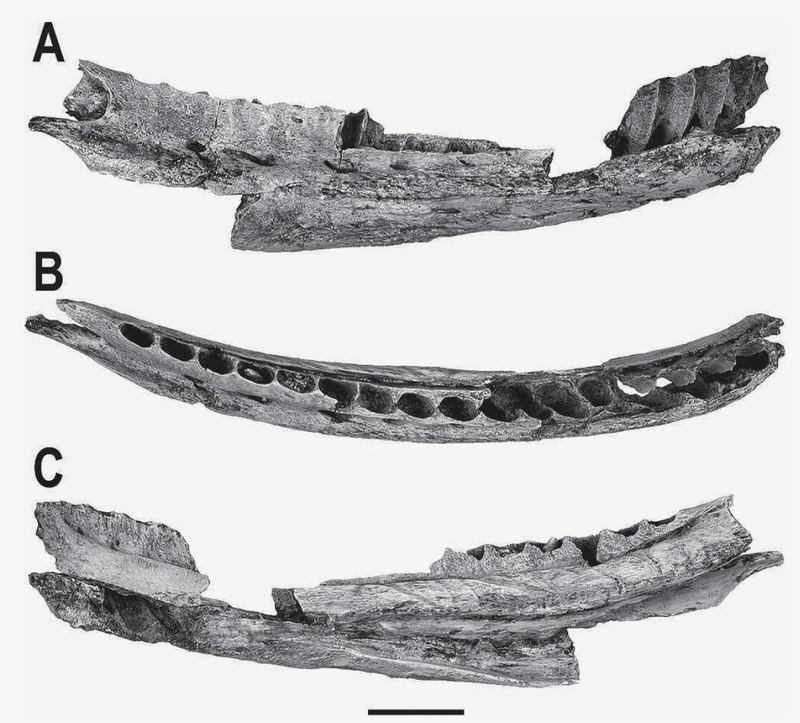 The teeth of the Malagasy abelisaurid most closely resemble those of AMNH 1753, 1955, and 1960 from the Late Cretaceous of India (referred to Indosuchus raptorius by Chatterjee, 1978) but, importantly, the Malagasy taxon possesses weakly developed interdenticular sulci whereas the Indian specimens lack them (Smith, this volume)." If we go to Smith's paper in Sampson and Krause's edited volume, we read- "The morphology of FSL 92.306a is basically as Depéret (1896) described it (Krause et al., this volume:fig. 4A), except that the distal curvature profile is less strongly curved. Overall, the crown is very similar in morphology to the distal dentary teeth of Majungasaurus discovered subsequently (Fig. 21). The DFA classified FSL 92.306a as Majungasaurus (26.74 D2, p .001; Table 2), supporting the hypothesis that the tooth is morphologically congruent with dental material of this animal. I am thus confident in referring this crown to Majungasaurus." So the authors of the petition claim their own work supports Deperet's syntypes as undiagnostic, but their own cited work actually says the reverse- that one of Deperet's teeth is identical to those in more complete specimens AND that these Malagasy teeth can be distinguished from the most similar taxon. Now we can argue about whether the tooth actually is diagnostic, but I think the more important issue here is that Carrano et al. seem to have misrepresented the conclusions of their own work as evidence in their petition. Even if they changed their minds between 2007 and 2009, it would still be wrong to cite their older work for supporting a position it didn't. So of course given the lack of Comments, the Commission would assume Carrano et al. are citing their own work correctly and pass the motion, as they think the work has verified Deperet's syntypes are undiagnostic, thus fulfilling Article 75.5. And that's what they did, declaring the dentary to be the neotype in 2011. But if they knew the cited work actually argued a syntype tooth was diagnostic, they might not have. Though I can't recall a petition being rejected, so who knows. It's history now, and the dentary will be the neotype unless another is petitioned into existence in the future, but what should have happened is for Krause et al. to make FSL 92.306a the lectotype of crenatissimus without the need of the ICZN, then if later studies found another taxon with identical teeth, the ICZN could be petitioned for a neotype. Ah well, dentary it is. References- Deperet, 1896. Note on the sauropod and theropod dinosaurs from the Upper Cretaceous of Madagascar. Bulletin de la Societe Geologique de France, 3rd series. 24, 176. Lavocat, 1955. Sur une portion de mandibule de Théropode provenant du Crétacé supérieur de Madagascar. Bulletin du Muséum National d’Histoire Naturelle à Paris. 27, 256-259. Sampson, Krause, Dodson and Forster, 1996. The premaxilla of Majungasaurus (Dinosauria: Theropoda) with implications for Gondwanan Paleobiography. Journal of Vertebrate Paleontology. 16(4), 601-605. Sampson, Witmer, Forster, Krause, O'Connor, Dodson and Ravoavy, 1998. Predatory dinosaur remains from Madagascar: Implications for the Cretaceous biogeography of Gondwana. Science, 280, 1048-1051. Krause, Sampson, Carrano and O'Connor, 2007. Overview of the history of discovery, taxonomy, phylogeny, and biogeography of Majungasaurus crenatissumus (Theropoda: Abelisauridae) form the Late Cretaceous of Madagascar. In Sampson and Krause (eds.). Majungasaurus crenatissimus (Theropoda: Abelisauridae) from the Late Cretaceous of Madagascar. SVP Memoir 8, 1-20. Smith, 2007. Dental morphology and variation in Majungasaurus crenatissimus (Theropoda: Abelisauridae) from the Late Cretaceous of Madagascar. In Sampson and Krause (eds.). Majungasaurus crenatissimus (Theropoda: Abelisauridae) from the Late Cretaceous of Madagascar. SVP Memoir 8, 103-126. Carrano, Krause, O'Connor and Sampson, 2009. Case 3487 Megalosaurus crenatissimus Depéret, 1896 (currently Majungasaurus crenatissimus; Dinosauria, Theropoda): Proposed replacement of the holotype by a neotype. Bulletin of Zoological Nomenclature. 66(3), 261-264. Paul and Carpenter, 2010. Allosaurus Marsh, 1877 (Dinosauria, Theropoda): Proposed conservation of usage by designation of a neotype for its type species Allosaurus fragilis Marsh, 1877. Bulletin of Zoological Nomenclature. 67(1), 53-56. ICZN, 2011. Opinion 2269 (Case 3487) Megalosaurus crenatissimus Depéret, 1896 (currently Majungasaurus crenatissimus; Dinosauria, Theropoda): Designation of a neotype. Bulletin of Zoological Nomenclature. 68(1), 89-90. Happens all the time; take a look at the Bulletin of Zoological Nomenclature (at the ICZN website). And I'll check if anything happens to such neotype designations if the original type is found to be diagnostic. Well, a dinosaur petition. There was one I was reminded of after this post- Halstead (1970) petitioned the ICZN to suppress the name Scrotum humanum in favor of Megalosaurus bucklandii. However, the ICZN felt that such action was uncessary since it is not necessarily a M. bucklandii specimen. 75.8. Status of rediscovered former name-bearing types. If, after the designation of a neotype, the name-bearing type (holotype, syntypes, lectotype or previous neotype) of the nominal species-group taxon that was (were) presumed lost is (are) found still to exist, on publication of that discovery the rediscovered material again becomes the name-bearing type and the neotype is set aside (unless, following an application, the Commission rules that the neotype is to be retained as the name-bearing type)."